Santrauka: Every child should experience this wonderful, cumulative story, with its brightly coloured pictures of the tiny but greedy caterpillar that eats his way through one apple, two plums and three pears before turning into a beautiful butterfly. The board version stands up well to the inevitable poking of little fingers through the holes in the pages. (2-4 yrs) "In the light of the moon a little egg lay on a leaf." *************** This beautiful paperback format is perfect for storytime. 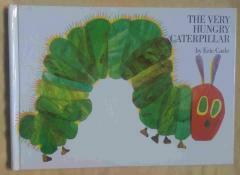 The Very Hungry Caterpillar, Eric Carle's world-famous simple, hopeful story has become the most read children's book in Britain. Its vivid and colourful collage illustrations are iconic, and it is a must have picture book for children. The bright and bold paperback makes it the ideal bedtime book for toddlers, with its die-cut pages and finger-sized holes, children can play and read along. "Every child should have a copy" - The Telegraph *************** Eric Carle's iconic illustrations have inspired generations of little readers, and his books are must-haves for every nursery.